Akiera’s original intention upon entering Northeastern was to be a doctor, but she quickly realized the sight of other people’s blood was not her favorite thing. After taking her first human services course, she never looked back. Akiera wanted a course of study that highlighted the social, political, and economic circumstances that shape people’s lives. Studying Human Services with a concentration in Public Health and a minor in Global Social Entrepreneurship has fulfilled her desire to become a changemaker in a career dedicated to social change. When Akiera switched to Human Services, she was looking for a program that would serve as the foundation for a career in social impact, regardless of what niche she decided to specialize. She had always intended to pursue a graduate degree at some point in time, and Human Services enabled her to more thoroughly explore what that degree program could be by exposing her to different areas of interest. Akiera has done research domestically and abroad, worked at a HIV/AIDS nonprofit in India, and is currently working at a startup to assist prisoner education using technology. The program has done exactly what Akiera wanted it to do thus far, and it will continue to allow her to build her network, and strive for social change. Human Services Professions, taught by Lori Gardinier, and Rebecca Riccio‘s “The Nonprofit Sector, Philanthropy, & Social Change” provided her with an overview of how nonprofits and other organizations function to work towards social change. Sexual Violence: Counseling, Programs and Policy, taught by BARCC’s Legal Advocate, pushed Akiera to do research on human trafficking, and gave her skills to work with women and girls – most of whom had experienced sexual trauma at some point in their lives – and frame her communication around certain topics accordingly. The course taught Akiera essential communication and coping skills that extended beyond sexual trauma and carried into her work with prisoners. 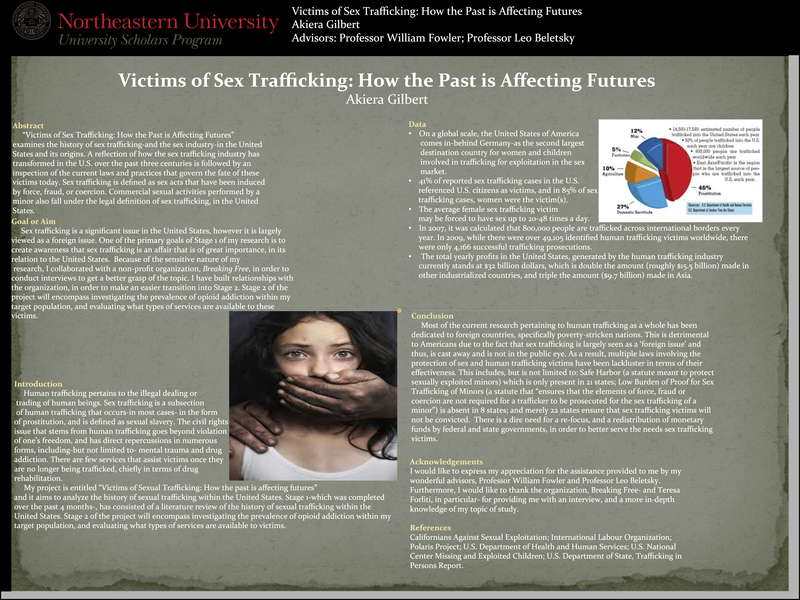 During undergrad, she immersed herself in research across a wide variety of social impact sub-disciplines, from human trafficking to drug abuse to sexual violence. Akiera took her research globally as an Independent Research Consultant where she analyzed the effectiveness of a mobile messaging sexual gender-based violence (SGBV) tool in an informal settlement in Nairobi, Kenya for an NGO. Akiera participated on the Dialogue of Civilizations to Cape Town, South Africa, featuring a unique two-week intensive micro-enterprise consulting program in partnership with TSiBA in the surrounding townships. Akiera served as team consultant at the Women’s United Association. She used region-specific industry analysis to identify opportunities in mobile application development. Akiera summarized opportunities for revenue generation, while prioritizing social mission and created a financial model and cash flow. She also assumed the roles of recruiting potential partners, pitching models, and establishing partnerships with local and international organizations and clients. Immediately after graduation, Akiera was selected to be an AIF Clinton Fellow in Mumbai, India. She served as a member of a 26-person Fellowship class, with a 5 percent acceptance rate. As an AIF Clinton Fellow, Akiera utilized product/UX design processes to develop mobile technology for a female empowerment program. For the new technology systems developed for the mentoring program, Akiera managed project lifecycle and implementation. She created and sustained partnerships with education and financial stakeholders to research school girls’ access to public spaces. As of Fall 2018, Akiera was working as a Client Implementation Specialist at American Prison Data Systems, a B Corp based in New York City, where she was developing and implementing ed-tech solutions for prisoners, in order to push for lower recidivism, and safer/cost-effective outcomes. In this role, Akiera is responsible for launching and deploying tablets at new partner sites, monitoring their progress, gathering feedback, and implementing solutions. Akiera intends to continue her education and is considering the option of pursuing a graduate degree, and starting her own social enterprise. This is Akiera's Northeastern Pathway... Where will yours lead? Na “Angelina” Li spent the first 11 years of her professional life working at Radio Beijing Corp. (RBC) as a news anchor, reporter, editor, and director. However, having not yet satisfied her career ambitions, she sought new adventures and challenges — she decided to pursue a Master of Public Administration (MPA) at Northeastern University. Since her graduation in 2017, Angelina has been applying her video production and policy analysis skills at the Lincoln Institute of Land Policy, the foremost U.S. think tank concerned with the links between social equity, economic progress, and land policy. As a young child, Martin knew he wanted to pursue criminal justice. As early as first grade, birthday cards from other kids would wish him good luck as a future police officer. While he isn’t necessarily going into policing, Martin has stayed true to his desire to help others in the field of criminal justice. Francesca’s childhood was spent growing up in South Africa as a member of the Born Free generation, the first generation born after the end of Apartheid. Inspired by the incredible progress since Apartheid, she realized that change can truly be made through the dedication of a single individual, and that this has the potential to create an incredible ripple effect. With a strong desire to learn, she focused her studies on the political, economic and social structures that would fundamentally transform the country that had ignited her passion towards creating a more just and peaceful world for every individual. Francesca is currently pursuing a B.S. in Politics, Philosophy, and Economics.